Top 20 Mossel Bay Restaurants 2017. Mossel Bay may be a harbour town of note, especially with its Garden Route location. And while there are great activities and places to see here, it’s also something of a foodie haven. Trading under a nickname (Carola Anne) she received in Chef School when people struggled to pronounce her name, Corelie holds a business degree, making her an unlikely chef. At Carola Anne’s, she does food for life, and is big on combining both raw and cooked food. She makes great food, which is as healthy as it is beautiful to look at. The coffee is equally good. Happily, Corelie also offers catering services too. 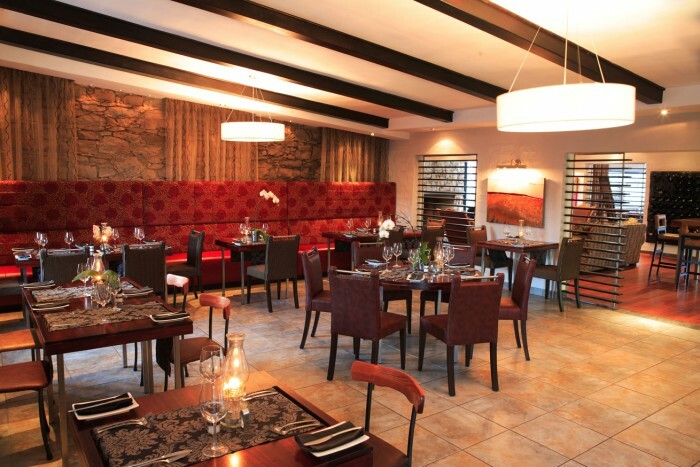 Known as Mossel Bay’s seafood house, Café Gannet Restaurant is acclaimed for its local seafood delicacies. With sweeping views of the Indian Ocean, it offers great meals in a trendy space. Tuck into coastal oysters, Mossel Bay sole, pizza, salads and even light lunches and meat dishes too. Bookings are advisable due to its popularity. If you’re craving a casual, braai-orientated restaurant, then Kaai 4 is for you. Enjoy popular SA meat-dishes, like spitbraais, potjiekos options, whole fish off-the-grid and freshly baked bread. With its harbour-fronting location, expect an informal slice of paradise at this rustic, family-friendly eatery. Kaai 4 also caters to weddings, birthdays and other special functions. 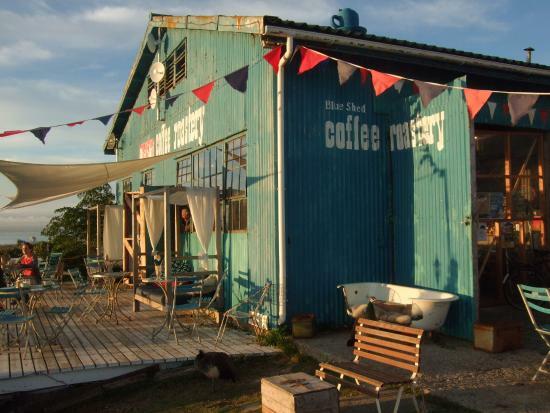 Considered by some to serve the best coffee in SA, The Blue Shed Coffee Roastery is a coffee lover’s haven. It’s also a local supplier to other eateries, including Kaai 4 and Sea Gypsy. Its mission is ‘simple’: produce the perfect cup of coffee every time. It’s a wonderfully relaxing spot, where guests can unwind or book for special functions. Those with a sweet tooth should have their coffee with the chocolate brownies, although they also offer savoury eats here. Part of professional golfer, Louis Oosthuizen’s 57 brand, Route57 is headed up by chef-patron Anzelle and her team. They invite you to enjoy tasty South African dishes and true local hospitality with them. This stylish restaurant provides a large, varied menu for guests to order off. Dishes are made from only the freshest ingredients, ensuring optimal quality. This roastery and coffee shop offers, not only delicious coffee blends (made from globally sourced beans), but also mouth-watering Israeli dishes and gorgeous cakes. The coffee is also available for order, and can be posted or couriered to anywhere in South Africa. This family-owned Indian restaurant in Eden Plaza is something of a hidden gem. It offers friendly staff and delicious cuisine. The eatery is overseen by hands-on owner Mr Gill, ensuring good service. If you love Indian food, then theirs is apparently possibly some of the tastiest you’ll discover in SA. They offer meat and vegetarian dishes, so everyone’s tastes are catered for. 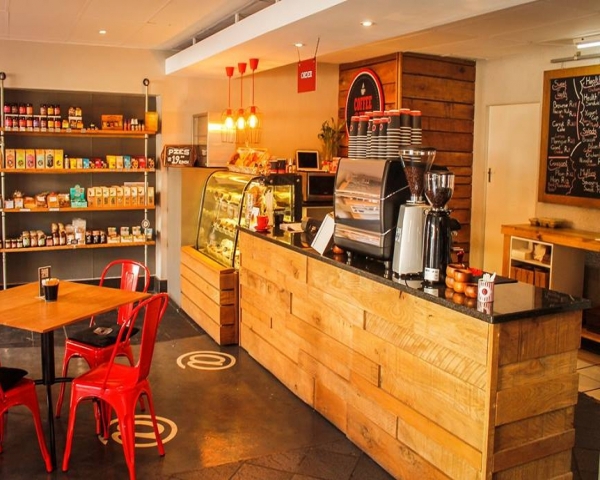 This trendy coffee shop is found in the heart of Mossel Bay CBD and is a well-loved among locals. Since it was voted as South Magazine’s winner for favourite coffee in the Garden Route 2016, you’ll find quality java here. They also offer a selection of tasty little eats to enjoy with your coffee. While visiting, stock up on the purchasable coffee blends. With a passion for food and made-to-order, delicious eats, Delfino’s offers an array of good food, which even includes banting-friendly options. Sink your teeth into light meals, fish dishes, grills, burgers and gourmet pizzas, as you sip on one of their great drink options. With light, cheerful décor and seating indoors and outdoors, this seaside-facing restaurant has it all. Blessed with breath-taking views of the bay and beautiful Outeniqua, Stars Restaurant and Sports Bar is well-known in town for serving good food at affordable prices. It’s also a trendy and vibey restaurant, where guests can enjoy music, sports and more. If you’re looking for a laid-back spot, this should be your go-to choice in Mossel Bay. If you’re after incredible seafood and other good eats, then Sea Gypsy Café is the place for you. 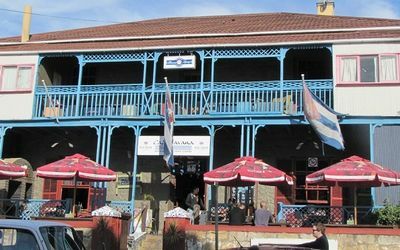 Found at Quay 4, Mossel Bay Harbour, this welcoming eatery offers fresh, tasty food and delightful views. Here, friendly service makes for a great added bonus. Offering both mouth-watering sushi and seafood, as well as superb sea- and beach-views, Kingfisher Restaurant is perfect for tasty food in a chilled setting. Enjoy line fish, prawns, calamari, ribs, ostrich, T-bone and sushi bar favourites at this seaside eatery. Found just outside Mossel Bay, near Pinnacle Point Golf Resort, Admiral’s Buffet Restaurant is hailed as one of the Garden Route’s most beautiful restaurants. Particularly since its 2009 revamp. 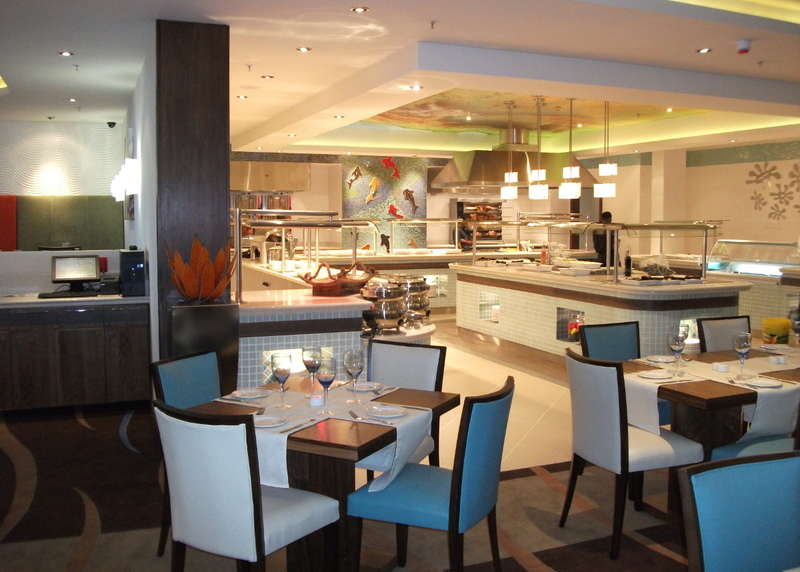 Enjoy delicious buffet-style food in a cutting-edge, 210-seater restaurant. Anything from traditional Bobotie to succulent beef roast and even mouth-watering desserts, like peppermint tart, can be found here. Enjoy a laid-back meal at De Vette Mossel, where top-class, value-for-money seafood is the order of every day. Seafood is prepared fresh – and served immediately thereafter. As a stunning welcoming gesture, guests receive a complimentary glass of Cape wine on arrival. They also have a cash bar and host of cocktail options. Providing superb views over the bay and of the mountains, Fork and Train Restaurant lies next to Santos Express Train Lodge. This pretty, family-friendly restaurant offers guests a well-balanced, traditionally South African-style menu, with fresh seafood and continental dishes available for your enjoyment. This restaurant and cigar lounge remains true to the Cuban spirit, serving traditional Cuban fare. Enjoy great specials on chicken wraps, Cuban Burger night and much more. You can also have cocktails and tapas out on the deck, or choose from a selection of Cuban cigars to puff on. Located at Groot Brak River’s old railway station, the charming Transkaroo Restaurant offers a unique location. It serves contemporary South Africa cuisine. This is enhanced by a few creative twists of its own. Service is also tops, making for a great, all-round experience. This quirky restaurant – housed in an actual bus-themed setting – offers fresh seafood options, including popular fish and chips, and calamari. You will enjoy amazing views – but it can get a bit nippy in cold weather, so bring a spare jersey or jacket along when visiting! This restaurant and pub provides prime views over the bay and of the distant mountains. It serves both seafood and traditional meals. These include: burgers, steaks, ribs, breakfasts and pub-lunches. It’s a venue for both young and old to enjoy, and also caters to functions. With stunning views over the sea and nearby rocks, The Lighthouse Restaurant possesses one of the Garden Route’s most dramatic restaurant settings. Enjoy the likes of Mossel Bay oysters, fresh line fish and buffet breakfasts. While you’re there, sample one of their sundowners. These are just some of the delightful eateries you can enjoy when visiting this special Garden Route town. Previous Previous post: Top 20 Pretoria Restaurants 2017. Next Next post: Top 20 Port Elizabeth activities 2017.